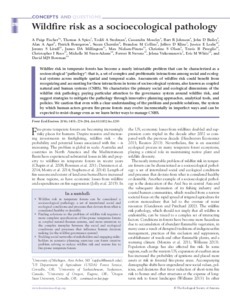 Wildfire risk in temperate forests has become a nearly intractable problem that can be characterized as a socioecological "pathology": that is, a set of complex and problematic interactions among social and ecological systems across multiple spatial and temporal scales. Assessments of wildfire risk could benefit from recognizing and accounting for these interactions in terms of socioecological systems, also known as coupled natural and human systems (CNHS). We characterize the primary social and ecological dimensions of the wildfire risk pathology, paying particular attention to the governance system around wildfire risk, and suggest strategies to mitigate the pathology through innovative planning approaches, analytical tools, and policies. We caution that even with a clear understanding of the problem and possible solutions, the system by which human actors govern fire-prone forests may evolve incrementally in imperfect ways and can be expected to resist change even as we learn better ways to manage CNHS.